16 bit analogue output, in voltage or in current. Programmable as 0...5/0...10Vdc, 0...20/4...20mA through the indicator or through the PC with Dinitools. Particularly suitable for use with PLC’s and in industrial environments. Output values programmable through the indicator or through the PC Dinitools: 0...5/0...10Vdc or 0...20/4...20mA. 16 bit resolution (65536 divisions). Update frequency: from 30 to 50Hz (depending on the weight indicator). Precision: minimum +/- 0.08%, typical 0.015% in relation to the F.S.O. of the analogue output (operating temperature 25°C). Maximum applicable resistance on the output in current: 300 ohm. Minimum applicable resistance on the output in voltage: 1 Kohm. Easily configurable through the indicator or through the PC using Dinitools. 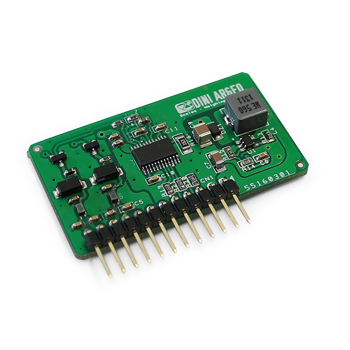 DAC16O-1 Built-in analog output, 0-4/20 mA, 0-10VdC (cable gland excluded). For DFW, 3590 and CPW indicators. NOTE: For 3590, only with IOEXPB optional board. TAKE NOTE: this interface is not available on its own. Maximum length for analogue output in current - 100m. Maximum length for analogue output in voltage - 50m. Maximum length for analogue output in current - 150m. Maximum length for analogue output in voltage - 75m. Maximum length for analogue output in current - 300m. Maximum length for analogue output in voltage - 150m.